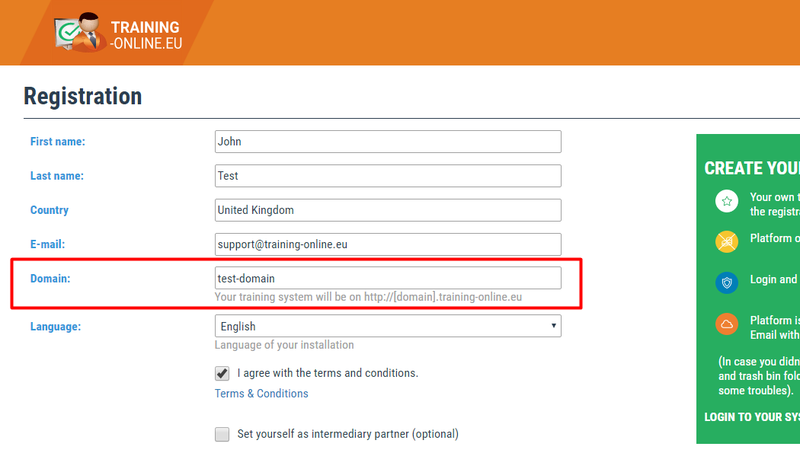 Registering to Training-Online.eu system and all the system control is done as the self-service supported by automatic email notifications. You should be able to make your registration, receiving password or its recovery yourself. As you Register for the eLearning system, your own and unique platform is created. - your eLearning platform is located on the address domain_name.training-online.eu The domain_name is the name you have selected within the registration process. Each user (administrators including) then accesses the platform on this unique address. The address is distributed to your users once you create their profile or assign the courses to study. You may adapt all your system notifications to include the LMS address name. In case you set your own LMS address, you may enter the LMS on both addresses. - Registration email is sent to your email address you have provided during the registration process. In case you didn’t find our welcome email in your mailbox, check also spam and trash bin folder. You may also use our contact form in case you face some troubles. Ask yourself the questions before you contact our support: Have you checked all your mail folders properly? In case you have provided an incorrect email address, it can't be sent to your email mailbox. We do recommend to make a new registration where you make sure you provide a correct one. Unfortunately even though you contact our support with a request to change the email address we can't perform this action as we accept requests from same email as it was used during the registration, any differences are considered as no accordance. - Registration email contains direct login link which directs you to your platform and lets you select your Password. Use this link to get into the system. You will be asked to select your password and confirm the password. Once you set your password you are logged into your eLearning platform. Edited 2 time(s). Last edit at 01/31/2017 08:53PM by admin_admin.